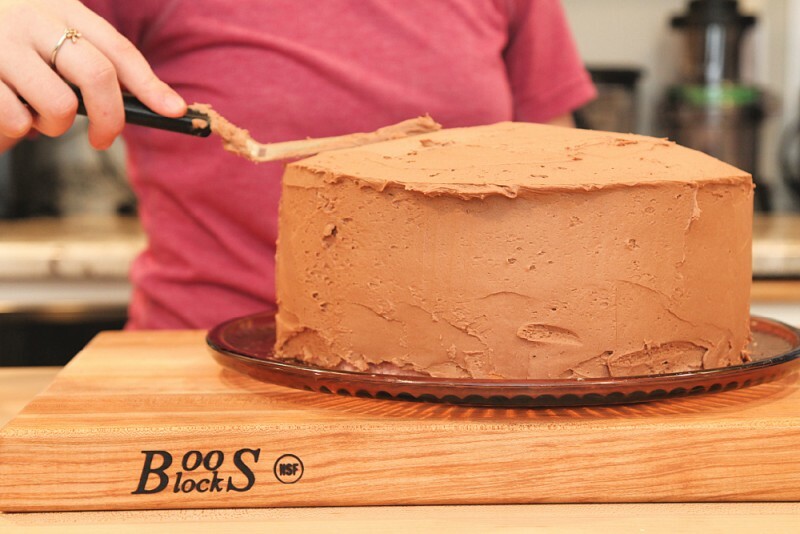 Making The Most Of Our Butler Pantry With John Boos (+ Chocolate Buttercream Frosting Recipe) + GIVEAWAY! I received product from John Boos to facilitate this post. All opinions are my own. We may have been a little crazy last year. Because, let’s be real here. Who in their right mind starts a big renovation project the week BEFORE Christmas…..!? Turns out, we do. What started out as a small, two wall removal somehow morphed into renovating almost our entire main level plus an upstairs loft. But now that the end is so very close, let me tell you that the pain was worth it. For a couple of months, we were basically living out of our garage. Our flooring was torn up everywhere. And because walls were removed and ceilings were torn into, dust-covered every open space. It was pure chaos. But now, we’re busy enjoying the wonderful results. And with the help of John Boos, we’re making the most out of our butler pantry too! 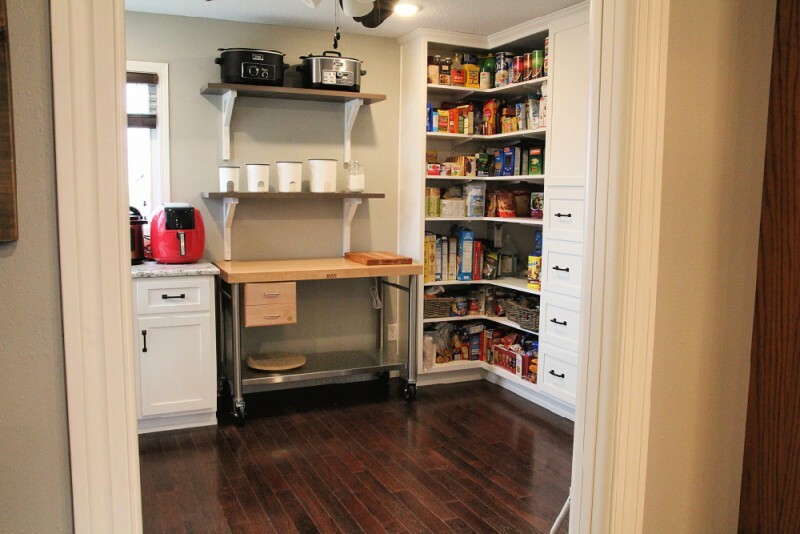 First off, I’ll share a bit about the design of our pantry. In my book, there are a lot of must haves for a butler’s pantry. At the top of my list was a second oven. 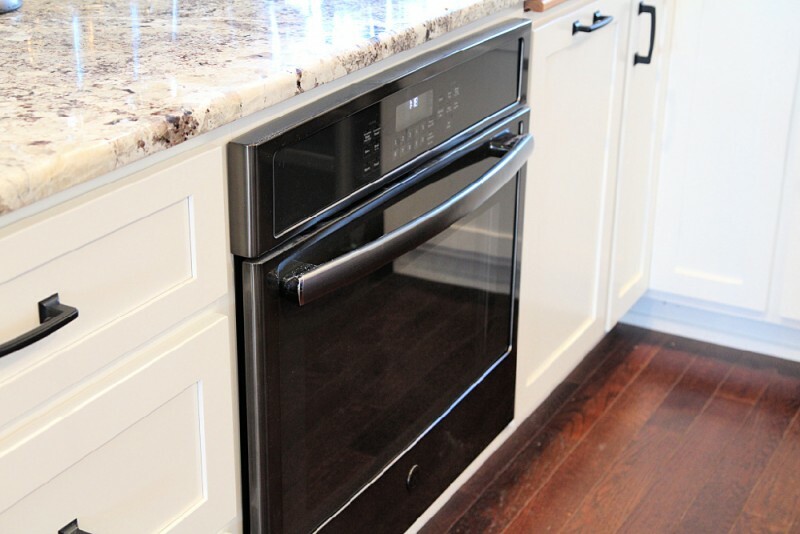 While we purchased a ‘wall oven’, we actually had it installed below the cabinets so we wouldn’t lose any counter space. Working my way on, I wanted plenty of storage space. So I scoured Pinterest for ideas and actually designed the pantry by compiling everything I wanted. And I’m really happy with the results! 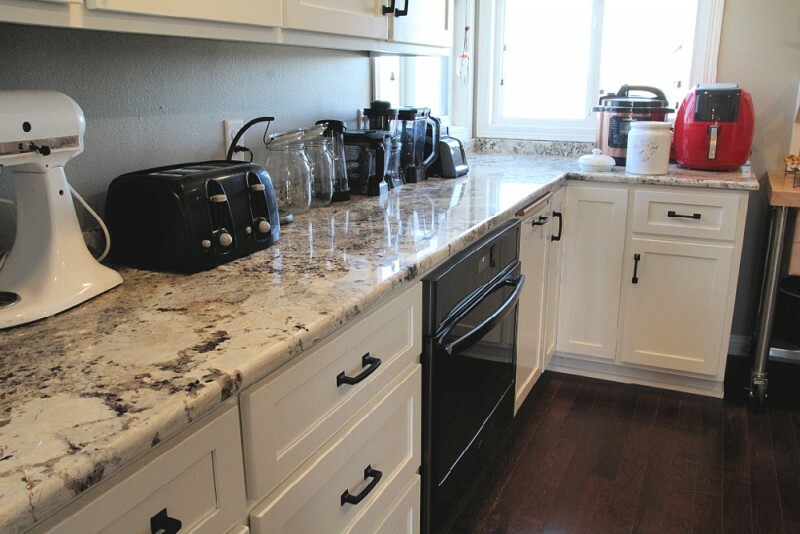 We have a wall of upper cabinets, granite counter top, and lower cabinets. On the other side of the room, I have some open pantry shelving, drawers for storing canned goods, and additional shelves with doors. As a family of seven, we go through a lot of food. So we actually moved our old refrigerator into our butler pantry and added a new one to our kitchen. Finally, the last must have for a butler’s pantry is a working island. And that’s where John Boos came in. They have so many high quality options, I just love everything they offer. But for the size, space, and functionality we needed, we settled on the “CUCIC” CUCINA MAGNIFICO Island Cart. In the center of our butler pantry, I made sure to leave some space for a ‘work island’. I wanted to have a piece of furniture that would be useful when we are busy baking, cooking, and prepping. But also something that could easily be moved out of the way when not in use. And let me tell you, the Cucina Magnifico Island Cart is everything I was looking for. A great thing about this Cucina Magnifico Island Cart from John Boos is the fact that it can easily be moved from space to space. We designed the pantry to have enough room under our wall shelves so we can store this beautiful cart when not in use. So we simply unlock the caster wheels, push it over, and lock them again. When we need the island prep space, it literally takes 30 seconds to have the cart in the center of the room and casters locked so it’s ready to go. It’s amazing! The high quality hard rock maple edge grain varnique finished top is gorgeous. It’s smooth and so pretty. I love how great it works when we need space to roll out dough, mix on desserts, or whip up a salad. NOTE*** This island cart is not meant to be used as a cutting board. 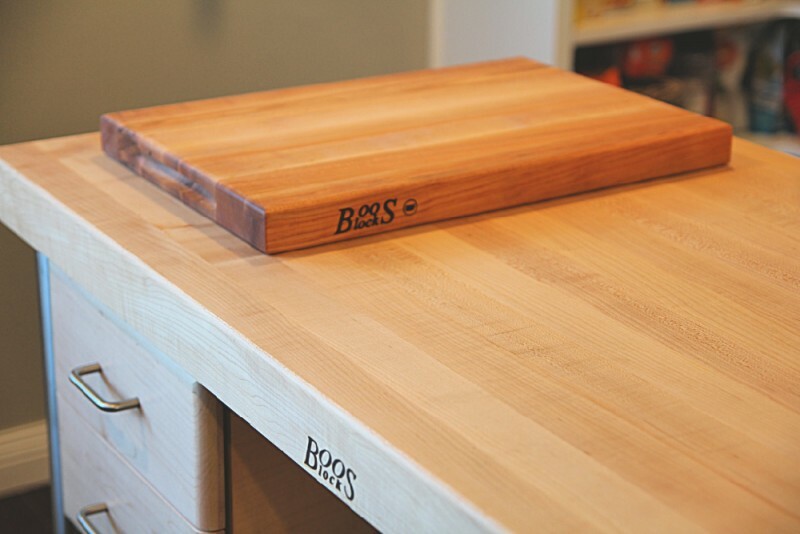 So definitely grab a separate John Boos Wood Cutting Board to keep on top the island for any cutting. For the wooden cutting board that we keep on top of our cart, there is a little care involved but it’s really quite simple. At least once a month, we just use John Boos Mystery Oil as directed on the bottle. Then, we follow up the next day with a coat of board cream. To keep these tools handy, we just store them in one of the island drawers. 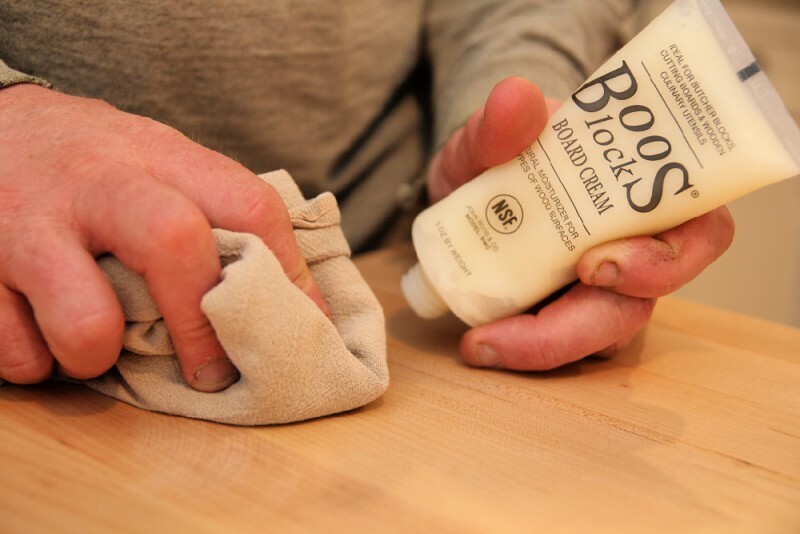 We love using the drawers to store our wood care products as utensils and tools we use when baking. So the fact that they designed this cart with two drawers is awesome. The top one is dedicated to our most used kitchen tools. So when, utilizing our cart, the drawer keeps them handy for us. The food grade shelf is the perfect place to store bowls and other equipment. Often times, I’ll keep one of my cookers there so they are easy to grab when I need to throw a meal in before heading out for the day. I LOVE LOVE LOVE the fact that John Boos designed this island cart to be able to hook up to electricity. The power strip that is mounted underneath the wood top is absolutely GENIUS! Seriously! 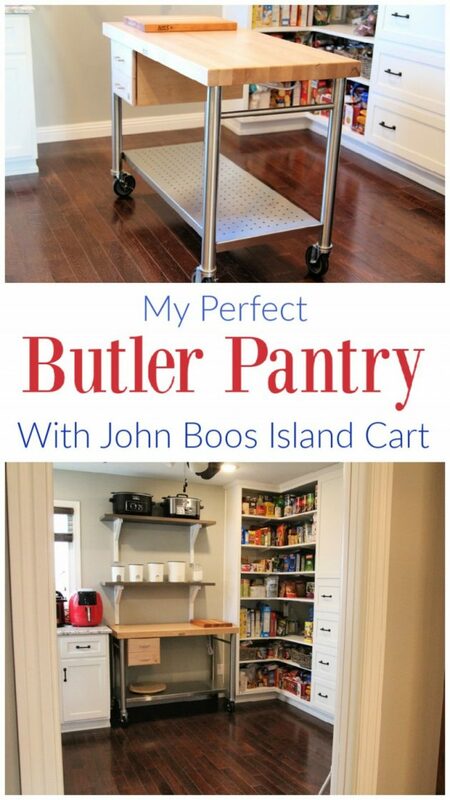 This John Boos Cucina Magnifico Island Cart is perfect. Almost everyone who has seen it has commented on how beautiful and functional it is. 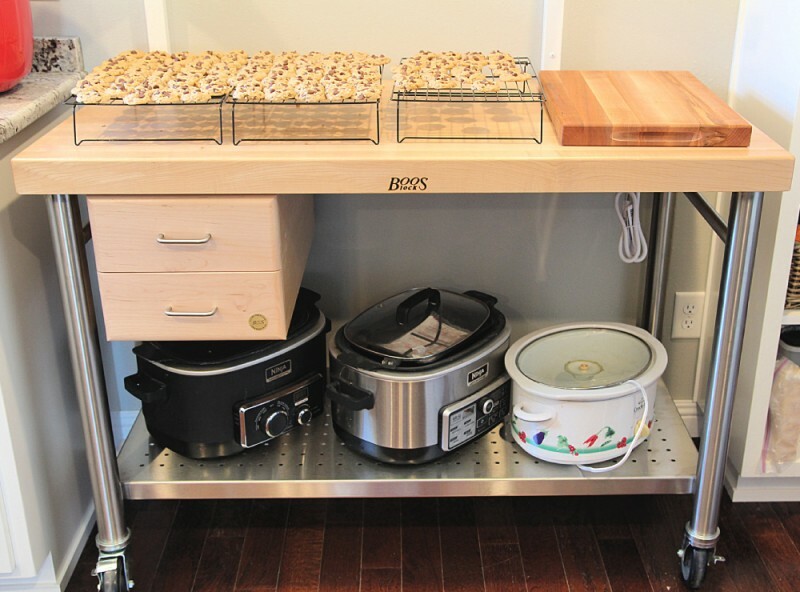 And I love that for holidays and parties, we can actually wheel it out to the kitchen or dining room for additional serving space! I just can’t recommend it enough. Definitely gets 2 enthusiastic thumbs up. 5+ stars. And the 1st place prize! 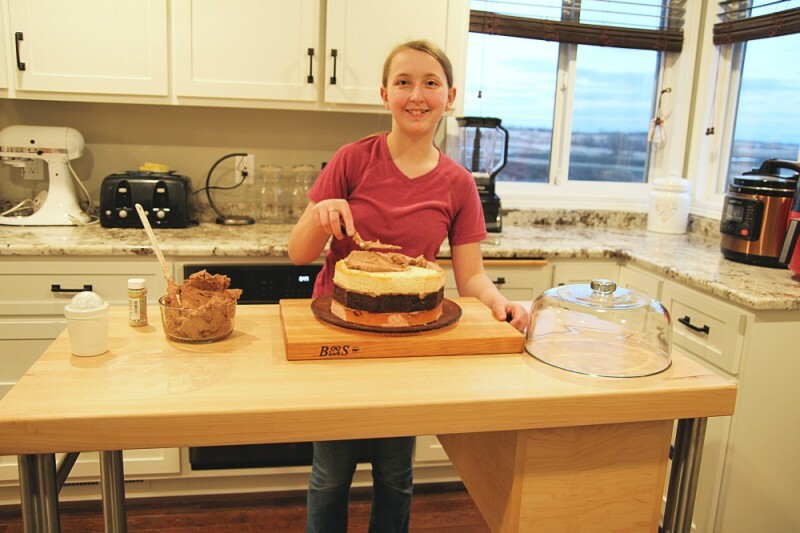 The very first time we used our island cart was when our oldest daughter made her birthday cake. It was a triple layer, gorgeous creation that tasted just as wonderful as it looked. 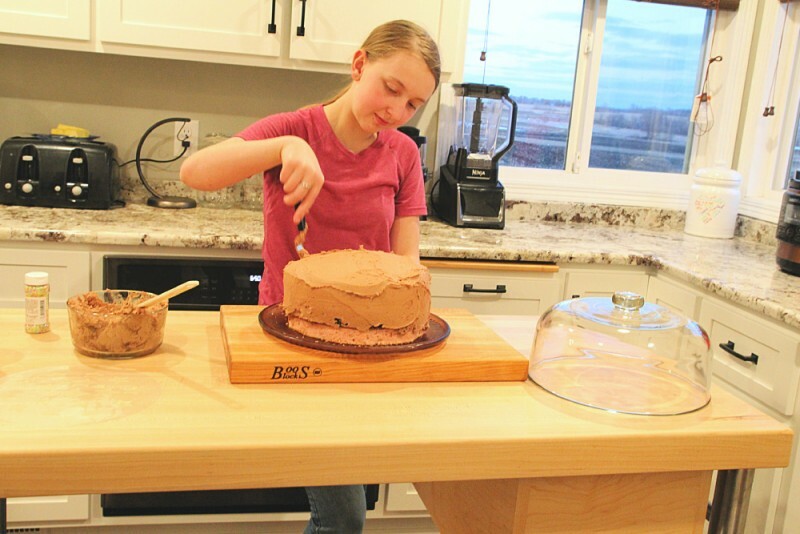 The island cart made for a great work station when making, stacking, and finally frosting her cake. 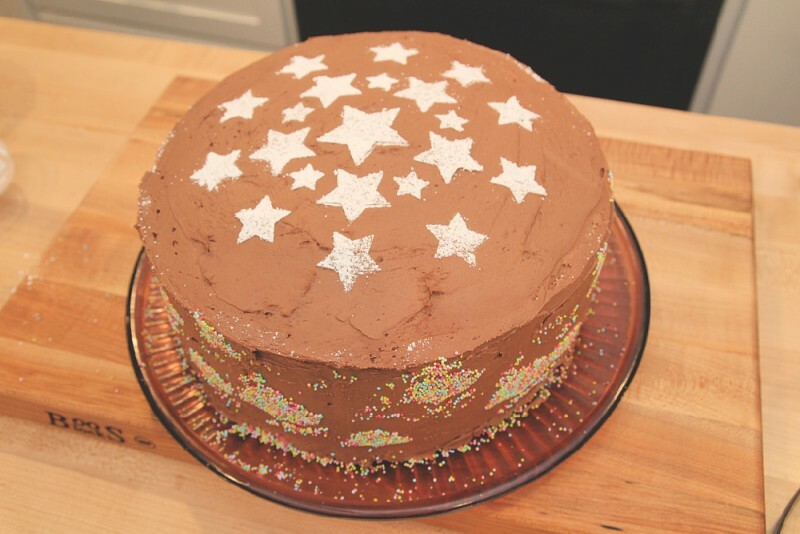 So I thought I’d share her delectable chocolate buttercream frosting recipe with you. It’s super easy to make and tastes so much better than canned options. 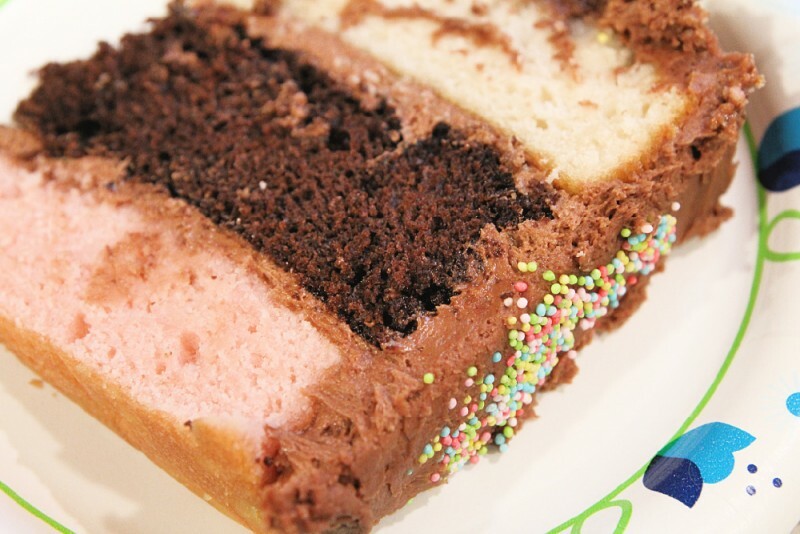 Perfect for cakes and cupcakes. 1 cup butter, room temp. Combine powder sugar and cocoa together in a medium sized bowl. Set aside. Beat butter and vanilla together in a mixing bowl for at least 2 minutes. Add the dry mixture to your butter. Mix. Slowly add milk a tablespoon at a time, beating constantly, till you reach the desired consistency. Frost your cake or cupcake. 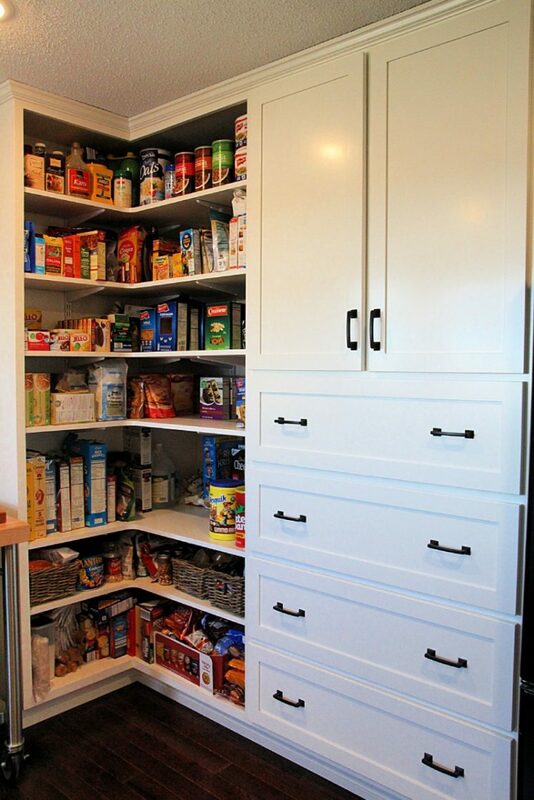 So tell me, what would be your top must have for a butler pantry? 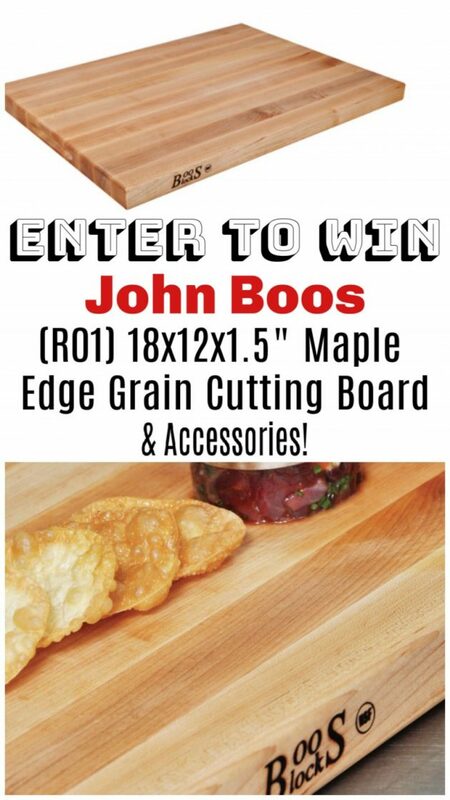 One lucky Emily Reviews reader will win their very own 18x12x1.5″ Maple Edge Grain Cutting Board, Mystery Oil, Board Cream, Applicator! Open to the Continental US only. Enter the widget below for your chance. Good luck! I’m a city girl turned country by my awesome husband and we have three busy boys and two darling daughters. I love spending time with my family, reading Karen Kingsbury novels, and catching up with friends while our kiddos have play dates. I’m blessed beyond measure and can’t wait to see what God has in store. This post currently has 101 responses. 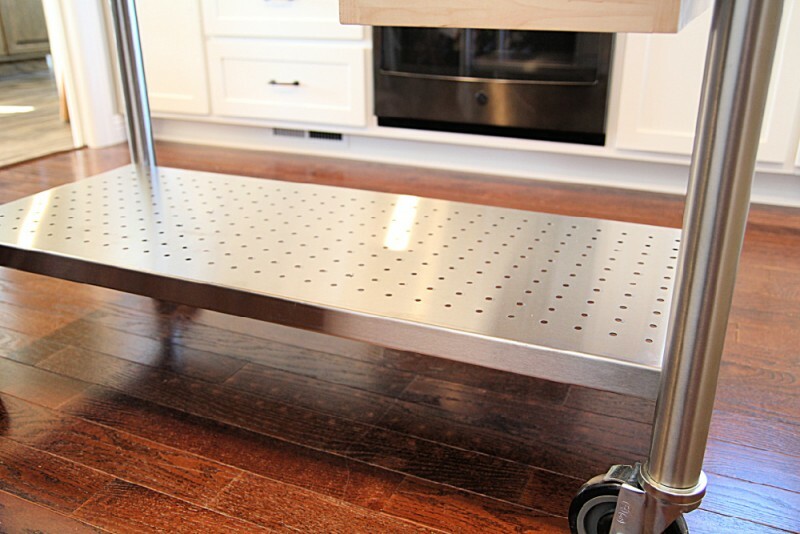 This cart would be such a help in out kitchen! We have limited counter space. Thanks! This would be so awesome to have. I love the look of the quality of the cutting board. I am in need of a new one and this one might be a winner. I love how they have products to take care of it! that means its a good item and worth the money! I wish I had this at my old place, we took out the island because there just wasn’t enough room in the tiny kitchen-but would have been nice to have been able to have one and move it to the side when not needed! I’m glad I caught this review. I’m on the hunt for a buffet for an under used space in my kitchen. Now I’m wondering if it’s an island I’d be able make that space functional. I am such a Foodie and Home Cook! Cooking is such a passion for me. However, I don’t know how on earth I ever made it without a John Boos chopping block. Love your home renovations; so lovely! I absolutely love the Island Cart! Perfect for my upcoming kitchen redo. 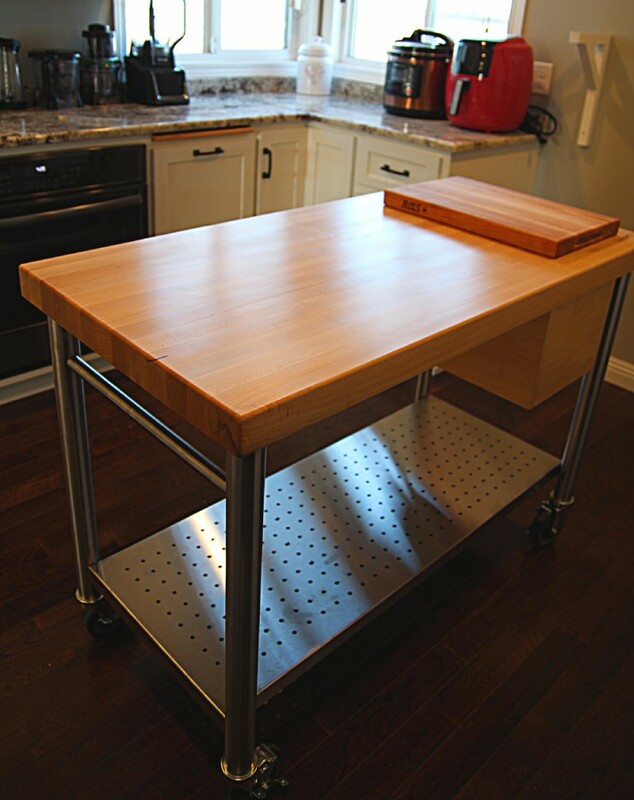 I love the cart and the beautiful cutting boards. They look high quality! I live in an RV. So I have limited counter space. A unit like this would be easy to move around in my rv and give me that extra storage and counter space that I lack. I love the sleek design too. The cutting board looks so nice. Perfect size for slicing up veggies and fruit. Honestly, I could even see myself using it as serving platter for cheese and meet for entertaining. I think that this block looks very sturdy and nice. Another blog, over a year ago, featured John Boos and now I am a huge fan. I love the color of the maple. I’d love to be able to move the cart around my kitchen. I really need a new cutting board. I love the island, wish I had one. I love your storage solutions. The cutting board looks really nice too. What a well-organized kitchen. The cutting board is of high quality. 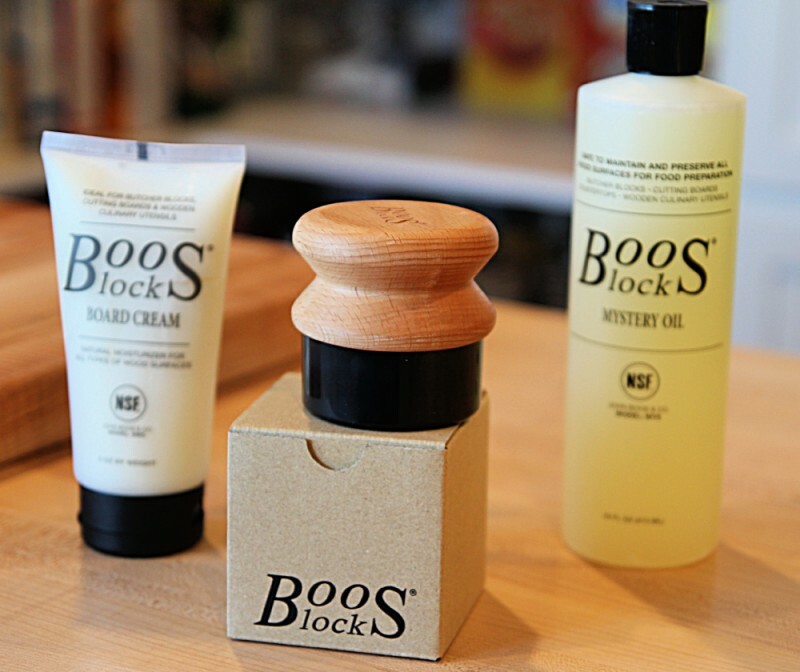 The John Boos products are all so gorgeous! And your kitchen is amazing. That is simply amazing! I cook and bake so much this would be awesome to have in my kitchen. I absolutely love this cart. My kitchen is so small and so is my cooking and chopping area. This would solve so many problems. I love this! I hate cluttered counter tops also. It stresses me. There are items I don’t use every day, such as my Ninja blender or my Mealthy Pot. It would be nice to have someplace to put them! I absolutely love the Island Cart and especially since it has wheels on it so you can move it to where you need it! I’ve never used board cream or mystery oil before. This board is a nice size! The kitchen is gorgeous! I love the cart and the cutting board. The thickness of the cutting board is perfect and I love how there’s products to take care of the wood. This cart is exactly what we’ve been looking for our outdoor room. It is so nice looking. They make the best cutting boards. They look made to last. geesh, so sorry, I just inputted the wrong data for todays tweet. I don’t want to loose credit for daily tweet. Here it is and I will IM you too. For a long time now I’ve had my eye on one of their cutting boards. It’s a dream of mine to own one, someday! I absolutely love your Butler pantry. It is so roomy and functional. That John Boos cutting board is beautiful. 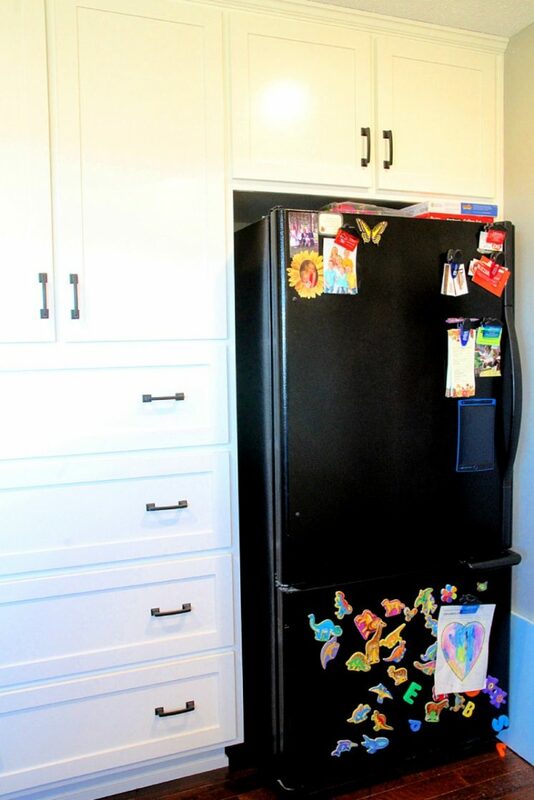 This would help improve my kitchen space and I could also use this for art projects. That’s a nice cart and the buttercream icing looks delicious! I’m guilty of not always using a cutting board. This one is too nice to forget to use. This cutting board is beautiful and the quality looks amazing! Who wouldn’t love to have this in their kitchen? Boos is such top quality. We bought one when we were first married, and it is stil in great shape!! I am loving the John Boos’ “CUCIC” CUCINA MAGNIFICO Island Cart! Such a beautiful, functional piece! I love that it has a power strip underneath the wood top. Love the island cart. 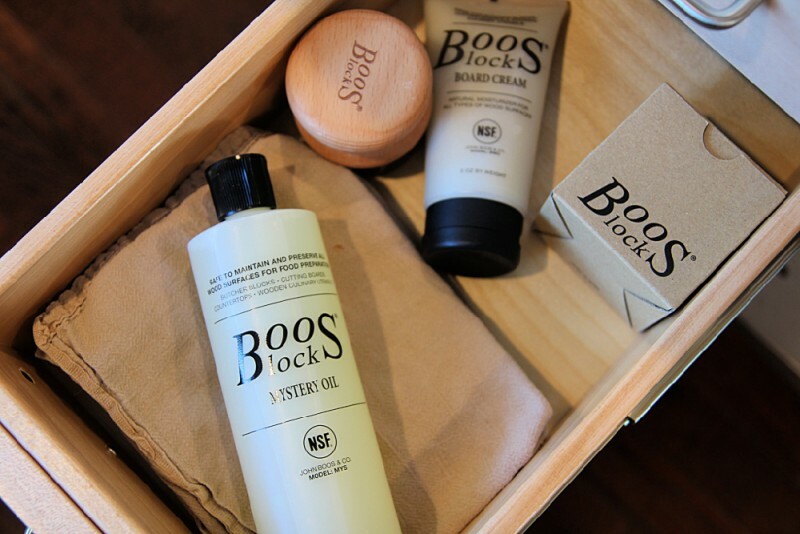 Beautiful quality products from John Boos. I live in a really small apartment. This would help a lot! I really love the color of the wood on the cutting board and learning how to care for it with the care products is amazing. I like the island that you can move it around looks great to use I need one in my kitchen. This island is awesome and be perfect in any chef’s kitchen even the simple cooks such as myself. It is very versatile and a need in every kitchen! Would love to have in mine while cooking and baking. Well designed and sturdy cart that would make an excellent carving table, especially for grilling. Hi! Meet the Emily Reviews writers here. This widget only shows 8 giveaways. View all of our Current Giveaways here. Copyright © 2010-2019 Emily Evert. All Rights Reserved.